The home decorations are at most a B-plot (really they're more of a series of recurring gags), while Chloe and Ice Bear are given the main story. They drive to the woods and almost immediately see a sign warning of wild turkeys. Chloe's briefly concerned, but the ax-wielding Ice Bear isn't threatened. They spend several minutes (and one short song - more on that in a bit) scouring the woods for a tree, but nothing they come across meets Chloe's expectations. Finally, they stumble across a wild turkey, though it certainly isn't aggressive. It is, however, awkward, so they pause to watch the creature cross over a frozen lake. Or at least try to cross the lake - halfway through the ice breaks and it tumbles into the frozen water. Ice Bear dives in after the creature and pulls it to safety, only for the newly revived animal to grab his scarf and run into the woods. Chloe and Ice Bear give chase, and the turkey eventually drops the scarf in front of - you guessed it - the perfect tree. Ice Bear cuts the tree down, and Chloe climbs onto it in victory... only to be carried down a hill when the tree slips. Once again, Ice Bear comes to the rescue, narrowly saving her from falling to her death, though he wasn't able to pull the tree up. Just when Chloe's resigned to losing it, the turkey reappears, alongside its flock, which takes off after the tree and flies it back up. If the outline for this episode sounds more than a little dull, rest assured it's because I pared it back to just the plot in order to avoid spoiling the important parts. See, the meat of this has nothing to do with what happens, but rather how it happens. And how it happens is funny. Strike that. It's goddamn hilarious. This might be the best portrayal of turkeys I've ever seen in animation, and the episode leans heavily on Ice Bear, who's... Look, if you've seen even a handful of episodes, he is almost certainly your favorite character. And while I can't claim this is the best Ice Bear episode, it's one of the better ones. The asides with Panda and Grizz decorating are fun, as well. The episode does a good job exploiting their quirks for laughs. The only low point I can find is the song. It's certainly not awful, but it just didn't work for me. It's a little too sweet and not quite fun enough, but even that's broken up with some phenomenal gags and mini-adventures. Ultimately, I'll say what I said after the first holiday installment: I absolutely recommend watching this, but - assuming you have the time - I'd suggest doing so in the context of the series. 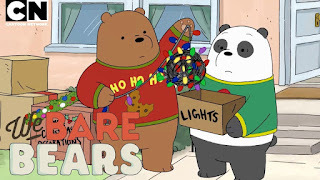 We Bare Bears isn't so plot-heavy that you can't watch it out of order, but there's enough nuance to the relationships and characters to reward viewing it as intended.